Reduce, Reuse, Remove The Cellophane: Recycling Demystified Are plastic bags recyclable? Why are Christmas lights a no-go? A recycling plant operations manager takes readers' questions about the process. Workers pull out plastic and trash from a conveyor belt of paper at a recycling plant in Elkridge, Md. The plant processes 1,000 tons of recyclable materials every day. It's easy to think we're being virtuous when we fill up the blue recycling bin and put it on the curb. But it's clear we have embraced some magical thinking when it comes to what can be recycled. Morning Edition asked its social media followers to share what puzzles them the most about the recycling process. 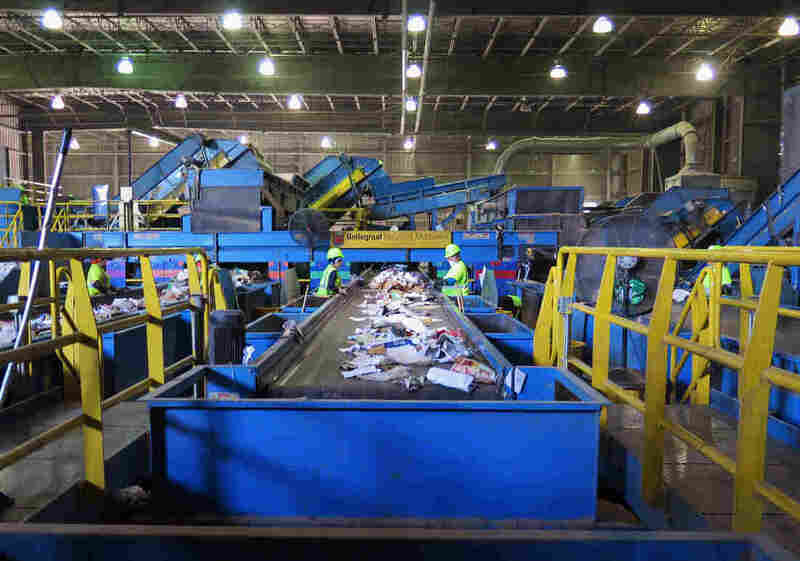 Then, NPR's Dianna Douglas visited a waste management plant in Elkridge, Md., to get the answers from Michael Taylor, director of recycling operations for the plant. Taylor's No. 1 tip: Don't recycle plastic bags, even if they're full of newspaper. They gum up the whole processing system. Every few hours Taylor has to shut down the machines to remove all the plastic. Take your plastic bags back to the grocery store, Taylor says. And don't just throw your flip-flops, bowling balls and Christmas lights into the blue bin because you think they should be recyclable. Below are five more of his responses to readers' questions. Q. Does washing containers help? Or is it a waste of water? — Robert Kisling, Stillwater, Okla.
A. In some instances it is actually helpful because a jar of jelly or a half-empty soda bottle will contaminate the other material. So, we prefer that materials get rinsed before they get put in the recycling bin. Q. Lightbulbs, of all kinds. Can't put them in curbside recycling, recycling centers won't take them, so what should I do? — Michelle Rafter, Portland, Ore.
A. (A lightbulb) is not recyclable because it's a different type of a glass than a glass jar. And they'll break anyway. ... We don't take plate glass either, like a window glass. That also is a different kind of glass than a regular food container or a beverage container. Q. Styrofoam! Why don't we recycle this? — Love Lulu, Philadelphia, Pa.
A. (Styrofoam) contaminates everything else when it breaks apart and comes through the plant. Q. Can you recycle the thick plastic overwrap that comes on cases of bottled drinks? What about the cardboard bakery boxes that have a large plastic window on them? — Deirdre Gabriel, Alexandria, Va.
A. While that plastic wrap may be recyclable, at this particular operation, we're not capable of recycling that material. It's actually a hazard to us ... it gets wrapped in all the mechanical moving parts that we use to separate the recyclable materials. We prefer that the cellophane be removed from the package before it gets recycled ... Too much of a particular item will (create) a circumstance where a container can go all the way to China and get rejected and have to be returned. Q. Is it true that recycling plants are so harmful on the environment that it sort of cancels out the act of recycling itself? — Jeffrey Sartor, Clinton, Miss. A. In this particular circumstance, a recycling plant like this, absolutely not. We are using high efficiency electric motors to drive the plant, to separate the material. We are basically taking a homogenous mix of recyclable material from a recycling bin and separating it into its components. If you look back over time, the value of the material that you separate is worth more than the process it costs to operate. In terms of harm to the environment, we are actually saving resources and putting things back in a more efficient way because of the recovery. Note: Different facilities can process different materials. Check with your local government to see what recyclables are accepted.